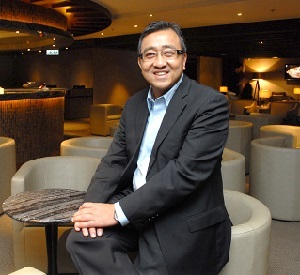 Song Hoi-see, founder and chief executive officer of Plaza Premium Lounge Management Ltd, has transformed the airport industry. After leaving his job as an investment banker to launch his own business, he started flying Economy Class, thereby losing his airport lounge privileges. He found the travel experience unpleasant and lacking in adequate services. Identifying a need to improve airport facilities, in 1998 he launched the world’s first Airport Pay-in Lounge at Hong Kong International Airport. Here, he discusses the company’s expansion plans for Heathrow. Q: Plaza Premium Group has major plans for 2017, in particular at London Heathrow Airport. What are they? We have recently opened a new lounge in the arrivals area of Terminal 4 at London Heathrow Airport. Much later in the year, we hope to open a landside Aerotel in Terminal 3 and a new departures lounge in Terminal 5A. Q: What facilities will each lounge have? Flight Club: The lounge in Terminal 4 Arrivals will have a unique aspect to it as we’re delighted to introduce our new dining concept Flight Club which is unique to both our lounge and the airport environment. Healthy eating is extremely popular and it isn’t always possible to eat healthily at an airport. So, as part of Flight Club we want to bring an unparalleled airport dining experience for all of our guests with the promise of healthy meals inspired by herbs and seeds. We want to take our guests on a culinary adventure to uncover bountiful fresh international delights, chef’s recommendations and an array of signature cold-pressed juices. Capacity: Holding up to 75 people and an overall size of 6,940 sq ft, the Terminal 4 Arrivals Lounge will also have a bar and lounge area. The lounge is also an ideal place for private meetings with a multi-functional room seating up to 20 delegates. There’s also 25 luxurious shower rooms for those passengers that travel for business or like to arrive feeling refreshed, whether it is for a business meeting or just from a long-haul flight. Compared to Terminal 4 Arrivals, the lounge in Terminal 3 Arrivals is much smaller; however, Plaza Premium Group is determined to provide the same first class experience in each of our lounges, no matter the size. Capacity: Measured at 3,352 sq ft and a capacity of 28, there’ll be a luxury lounge area plus 11 spacious shower rooms and a pressing service. Our one-of-a kind airport transit hotel located landside of Terminal 3 will provide comfort, convenience, and affordable room options for all of our guests. Each room, 87 in total, will be from 12-18 sq ft and there will be a mixture of twin and single bedrooms. Free wi-fi is also available and guests will be able to take advantage of the Library Lounge, which will serve both food and drink. Room service is also available providing snacks and drinks. The Terminal 5 Airside lounge will feature the company’s next-generation design concept, produced by Australian firm Mitchel Squires & Associates. A fresh ergonomic design, the lounge will come with a range of comfortable seating areas with an overall seating plan of 156. With runway views available, guests can enjoy a wide range of spirits in a rich, atmospheric setting in the new featured bar concept. That’s not all as we’ll have lounge seating and high dining areas available meaning we’ll be able to cater for each and every one of our customers. Q: What plans does Plaza Premium Group have on a worldwide basis? Construction work is well under way at Kuala Lumpur International Airport as we’re expanding the lounge on the mezzanine floor. The renovation exercise is being conducted in two phases. Work started at the end of December 2016 and will run until the end of May 2017. During the construction work, our lounge area will be partially closed. Following the renovations, the size of the lounge will increase to 7,500sq ft and offer comfortable seating of up to 200.